Cardiff City's record £15 million (S$27 million) signing is missing and presumed dead after his private plane went off radar on Monday night at 8.23pm. The Piper PA-46 Malibu plane had taken off from Nantes Atlantique airport around an hour earlier, and disappeared north of Guernsey as it made its way to Cardiff. A search was suspended on Tuesday night, with Guernsey police saying the chances of survival were "slim" if the plane landed in water. The Argentinian striker, signed from French Ligue 1 side Nantes, was set to train with his new teammates on Tuesday. The Premier League club has since cancelled the training session. "Hello, little brothers, how are you crazy people?" Sala says in audio messages posted to Argentinian website Ole.com, which claims they were sent to a WhatsApp group of friends and other players. "Brother, I'm really tired, I was here in Nantes doing things, things, things, things and things, and it never stops, it never stops, it never stops. "I'm here on a plane that looks like it's about to fall apart, and I'm going to Cardiff, crazy, tomorrow we already start, and in the afternoon we start training, boys, in my new team." The 28-year-old then sent another message later saying: "How are you guys, all good? If you do not have any more news from me in an hour and a half, I don't know if they need to send someone to find me … I am getting scared!" It has also emerged that Sala expressed concern about the plane to Nantes defender Nicolas Pallois, who dropped him off at the airport, which he said had been "bumpy" when he took it from Cardiff to France on Sunday, and also texted to say the plane was making "weird noises". The French civil aviation authority confirmed Sala was aboard a small passenger plane that went missing. Guernsey police said in a tweet they had found "a number of floating objects in water" after searching a 3,000-square kilometre area for 15 hours, but "no signs of those on board". Sala joined Nantes in 2015 and had scored 13 goals in all competitions this season for the struggling club. He had signed a three-and-a-half year deal with relegation-battling Cardiff on Saturday, saying: "I'm very happy to be here. It gives me great pleasure and I can't wait to start training, meet my new teammates and get down to work." Ken Choo, the executive director and CEO of the Welsh club, said they were "praying for positive news". "We were very shocked upon hearing the news that the plane had gone missing," Choo said. "We expected Emiliano to arrive last night into Cardiff and today was due to be his first day with the team. 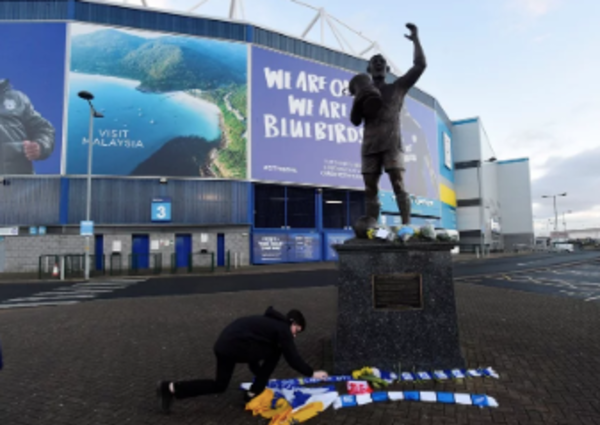 Tributes are left outside Cardiff’s stadium for Emiliano Sala. Choo later told Sky Sports: "We called off training today because everybody is not in the right frame of mind. Everybody is shocked at this point in time, including myself. "The second thing is I met him on Friday and he is such a nice person. He's so, so happy to be here and so happy to start. Words can't describe the look on his face when he met us and we walked him around the ground. "We knew him then and we really feel sad to hear of this news because he's such a great person. I think you could see the happiness in his face, one of the best days of his life as he expressed. So we are very sad, we want to thank people who have supported us today, with lots of messages and emails." Sala's tearful father Horacio told local press in Progreso, Argentina, where the player's family lives, that he was fearing the worst. "I don't know anything, nobody spoke to me, not a call from the embassy, the club, nobody," he said. "All I want is for you to find him." Hundreds of Nantes fans held a vigil in the city centre on Tuesday night to pay tribute to their former striker, whose last post on Instagram showed him with his former teammates, captioned with the words "the last goodbye". Nantes fans placed flowers and team scarves in the fountain at La Place Royale, and also laid down Sala's national flag or Argentina.